3D Academy hasn't added a story. My name is Celine Mnyakeni. I am 19 yrs old and I live in South Africa. I have been studying at 3D Academy - a leadership & life skill development program - for the last 6 months and have 6 more months to go. Together with the 3D team, we are appealing to you, to help us raise the required funds (US$4000) for my year. At age 14, my father passed away and my mother (a teacher) has struggled to provide for myself and my 3 brothers. Furthermore, we have an additional 4 family members living with us. I have always dreamed of becoming a forensic pathologist, but here in South Africa, turning that dream into a reality, is extremely difficult. Youth unemployment is nearly 40% and so many of my friends are finding themselves jobless. And that's where 3D Academy comes into the picture. 3D identifies high-potential candidates, from disadvantaged communities. They assist these young people in developing essential work and life skills. The program aims to bridge the gap between school and the world of work. Furthermore, they also help us network, thus opening doors for our futures. So over this Christmas period, I would like to appeal to you, to consider making a difference in my life and the life of the youth in South Africa. Your donation enables 3D Academy to tackle the issue of youth unemployment head-on and make a way for our futures! 3D Academy hasn't posted any updates yet. 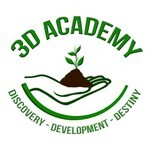 3D Academy is managing the funds for this campaign.